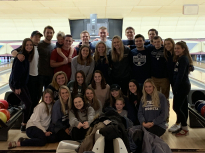 Stephen and Bridget Borlie got more than they bargained for when they agreed to let Penn State students stay in their home for a THON canning weekend. I’m interested in in-game production for a baseball organization. Whether it’d be calling a game over radio broadcasting or in-game announcing. I’m currently a fourth year student at Penn State University working towards a degree in Journalism. I have experience in both print and broadcast mediums. I’m currently a staff writer with the country’s most-read student media outlet, Onward State. I also work as a producer on the B94.5 Morning Zoo, a morning radio show in Centre County.